Two thirds of the state’s exports go to countries where it has representatives. Editor’s note: Updated to include comments from Mary Waters and clarification on the data used for the state’s trade numbers. Georgia’s exports declined for the second straight year in 2016 amid international headwinds like a strong dollar and soft demand in key global markets, even as it maintained its spot as the No. 11 exporting state in the nation. The numbers come at a time of uncertainty for global trade as President Donald Trump has pulled the U.S. out of the Trans-Pacific Partnership, a trade agreement encompassing 12 countries (including the U.S.) with 40 percent of the world’s economic output and also about 40 percent of Georgia’s export value. Mr. Trump has also pledged to renegotiate NAFTA; Mexico and Canada are two of the top three export markets for Georgia. The state’s steady export ascent over the last half-decade ground to a halt with a 2.1 percent decline in 2015, but this year’s drop was even more pronounced. According to newly released figures by the state, which uses Census data as well as private data sources to break out industry categories, exports fell by $3 billion, or 7.7 percent, to about $35.5 billion. The pace of decline was faster than the U.S. as a whole, which saw a 3.3 percent drop to $1.45 trillion, according to data from the U.S. Census Bureau. Irrespective of policy concerns at the national level, the Georgia Department of Economic Development is pushing ahead with initiatives to find new clients and to help the 14,500 Georgia businesses that already export intensify their overseas sales, said Mary Waters, the state’s deputy commissioner for international trade. “It’s really business as usual for us. Our job is always to help businesses be aware of the opportunities in the marketplace, regardless of what’s happening in policy at the national level,” Ms. Waters told Global Atlanta. She pointed out that Georgia products went to 214 countries and territories and added that many Georgia companies use the state’s services over an extended period to build their export readiness. Nearly 60 percent of firms using the state’s assistance have fewer than 20 employees. 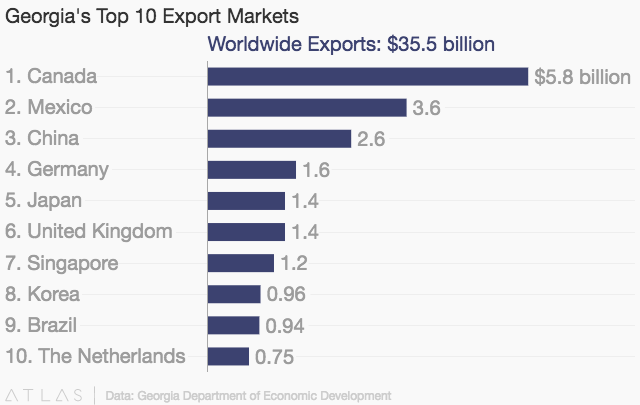 About two-thirds of the state’s export value goes to the 11 countries where the department has representation. Those reps — from Brazil, Canada, Chile, China, Colombia, Europe, Israel, Japan, Korea, Mexico and the United Kingdom and Ireland — will be in Atlanta for a “Go Global” reception March 14, at which companies from around the state will be honored for entering new markets over the last calendar year. “Our presence around the world helps us remain competitive and keeps our economy thriving. Companies in 95 percent of Georgia counties are actively participating in international trade, and I am proud of the work our International Trade team has done to support their efforts,” said Pat Wilson, commissioner of the department, in a news release. There were also some bright spots from the product standpoint, despite declines in aircraft sales and machinery exports, which account for about a third of the overall export value. Peanuts shot up by 81 percent thanks to demand from China, Vietnam, Colombia and Mexico, showing the importance of global markets to Georgia producers. The big increase came from China, a significant peanut producer in its own right, which had a slow crop due to weather issues, Ms. Waters said. “China was really able to turn to the peanut industry to pick up slack, and the result was a huge year for the Georgia industry,” she said. That shows the importance of engaging with global markets in agriculture, a sector where exports have already tripled over the last 15 years. Trade missions and meetings with inbound buyers can be important tools to help producers be more proactive in their sales cycles, Ms. Waters said. Georgia stemmed most of its prior losses in sales to China as its trading relationship with the country matured. Compared to a 14 percent drop last year, sales to the world’s second largest economy in 2016 fell only by 3 percent. Ms. Waters said the state is still bullish on the country as more Georgia companies look more deeply at the market, using the state’s office in Shanghai as a springboard. On the inbound side, Chinese buyers have been showing up with more regularity in Georgia, she added. The upcoming reception will provide a chance to honor companies that have made these leaps into exporting, Ms. Waters said. With exports totaling $2.56 billion, China was the No. 3 export market for the state behind Mexico and Canada. Canadian exports declined by nearly 10 percent to $5.88 billion, while sales to Mexico increased slightly to $3.58 billion. Both Korea (previously No. 12) and the Netherlands (No. 13 in 2015) snuck into this year’s top 10 markets. Imports, an important factor in sustaining the more than 200,000 jobs created through activity at the Georgia Ports Authority, declined by 2.7 percent to $86.2 billion. Most of the slide can be attributed to a significant decrease in imports from Germany from about $16 billion to $13 billion. Georgia was the No. 7 state for imports. Sign up for the GO Global reception here.